Global Initiative | Mafia-redux: is the Sicilian mafia in decline? 22 years ago this week, on the 23rd May 1992, the courageous Italian prosecutor, Giovanni Falcone, was assassinated by a car bomb that was so powerful it registered as an earthquake on local monitors. Falcone, along with his tireless partner, a magistrate Paolo Borsellino, had made it their lifelong crusade to suppress the Sicilian mafia, and they were killed for their work. Two decades later, a number of notorious mafia groups retain a stranglehold over stability, politics and the economy in Italy: the ‘Ndrangheta from Calabria; the Cosa Nostra from Sicily; the Camorra from Campania (Naples) and the Sacra Corona Unita from Puglia, as shown in the map to the right. The roots of the mafia in Italy run deep into the history of Italy, and as with many organized crime groups, their genesis began as a social and political movement. As the development of Italy bifurcated between the richer, industrialist North, and the poor agricultural South, the mafia was a means to antagonize the largely corrupt Southern government. Evolving in the 1600s from the system of landholders and the nobility who relied on militia groups to protect their power and influence, these groups provided protection, economic opportunity and social services in the absence of the state, by “taxation” (extortion) of the citizens in their region. Rather than considering themselves criminal, the members of the mafia families have traditionally referred to themselves as “uomini d’onore” – men of honour – providing a civic good. This has evolved and sustained a long-standing polarisation between the Italian State and the mafia, which is anti-State. There are many accounts of the rise and fall of various mafia groups, but all of these demonstrate that the mafia has proven itself to be quintessentially resilient. The profits of criminal enterprises have been laundered into political campaigns and legitimate businesses, making it increasingly difficult to eradicate. Moreover, they are quickly adaptive to prevailing political, social and economic characteristics of the environment. Historical analysis shows that the most advanced forms of crime, such as the mafia, are cyclically born, come to a climax, decline and then physiologically re-emerge in different outward forms that are better suited to the environment. According to mafia analysts, including in the latest report of the DIA (Italian Anti-Mafia Directorate), organised crime in Italy is going through a period of transition – and arguably decline – due to a number of external shocks that have reduced the viability of the traditional business models. While the mafia remains a potent economic force – the total value of all organised crime in Italy is estimated at more than $190 billion per year – several years of the economic recession that has affected all of Europe, and a number of major asset seizures by Italian law enforcement, have significantly reduced operating margins. Cosa Nostra boss Giovanni Di Giacomo was recently recorded in prison, complaining about the collapse of protection and extortion rackets. Public procurement contracts, another typical mainstay of mafia groups, have also slowed to a trickle as the economy declines. Even drug trafficking suffers from reduced demand in Europe, as clients see themselves with less disposable income available for recreational drugs, and West Africans have become increasingly engaged in the trade higher up the criminal economy chain. As a response, the mafia groups have had to seek new revenue sources. All of the groups have tried to reactivate and consolidate relations with groups overseas, or to use their incredible liquidity to penetrate new markets, both in the North of Italy, but also in Eastern Europe or further afield. For most, however, this has entailed going back to basics. The Cosa Nostra has returned to its roots: the extortion of landowners, merchants, and even, incredibly, the theft of livestock and the allocation of social housing. For example, last January, the mafia family based in the town of Gela was investigated for their involvement in construction projects, and leveraging this to control or tax the allocation of social welfare housing in favor of its affiliates. Similarly, in April last year, the police arrested members of the Montelepre mafia family of Palermo for stealing cattle in the district. 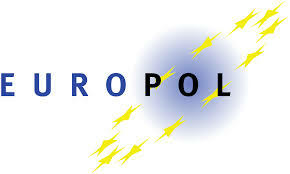 In the last week, the Police of Adrano, a village in the province of Catania, arrested two young men for extortion of 21 small landowners in the district using mafia methods. The young men belonged to the the Scalisi clan, who have historic connections to Benedetto “Nitto” Santapaola from Catania and the Sicilian Cosa Nostra. The ‘Ndrangheta have arguably been proved the most adaptive, in focusing on penetrating local politics through corruption, and specializing in money laundering, they have managed to penetrate broadly across the economy of the country as a whole, whilst maintaining a tight grip on local power dynamics in their region of origin, Campania. However, as the primary controller of most of Europe’s cocaine trade, their finances have probably suffered the least. The Camorra, by turn, have proved the most vicious in their survival methods. Analysts have noted a sharp increase in violence, and have also observed that the Camorra have made efforts to sustain an aura of insecurity and fragility for local residents, to ensure their endemic dependence on the Camorra for economic and social goods. After years of survival through the commission of low profile, low profit crimes, in the last year, there has been a distinct shift to try and regain some of the power and prestige of their halcyon days. The classic mafia model survives on networks of patronage, and without the profits to sustain “the family”, the model is increasingly under threat. The Corleone family, under Salvatore Riina, dominated the Sicilian Cosa Nostra in the 1980s and 90s, was responsible for a ruthless campaign of violence targeted against rival groups as well as the State. It was their bombs that assassinated Falcone and Borsellino two decades previously. Under public pressure, Riina was arrested in 1993, triggering a major lashback of terrorist acts aimed at civilians, churches and heritage sights. The resultant public outrage and government clamp-down that followed spelled the end to this reign of terror, but also of the family’s hegemony over mafia groups. With the fall of the Corleone family, the entire patronage structure that supported the Cosa Nostra suffered a backlash that has reverberated through its operations of the Sicilian mafia for the following two decades. Power has fragmented, as different groups have sought to dominate the Cosa Nostra, and there have been challenges from rival clans from neighboring provinces. In this more fragmented environment, some of the salient features of the Italian mafia have been eroded. As a result,membership has become more permeable, and less centered around the family structure and territorial control that has previously characterized the Italian mafia. While in recent years there have been attempts to reconstitute the classic structure, but in aggregate form through an alliances of the three largest families, from the provinces of Trapani, Agrigento and Palermo, and return the mafia to its glory days, but tight profits have made sustaining an allegiance a difficult challenge. In Palermo in recent months, there appears to be a smoldering of a new mafia war: on April 19 the police arrested eight suspects in Palermo for mafia-type association. The case, monikered “IAGO” by the police, showcased a struggle for control of the district of Porta Nuova in the heart of the city, of pivotal importance since it includes some of the most famous shops, the three historic markets of Ballarò, Capo and Vucciria, and most critically, Palermo’s harbour. In March, Giuseppe Di Giacomo, a senior figure of one of the three mafia families active in the city was gunned down on the sidewalk of Via dell’ Emiro, in the historic district of Zisa in Palermo. The investigation revealed that Giuseppe’s brother, Giovanni , ruler of the district of Porta Nuova until his arrest, had planned to anoint his brother as leader in his stead. Wiretaps revealed that his succession plan also included the murder of two rival gang leaders, Vittorio Emanuele and Orazio Lipari. The police intervened before the planned retaliation by his brothers could trigger another conflict to echo the glory days of the Corleone era. The above analysis offers two lessons. Firstly, it highlights the importance of studying the structural elements of the crime environment, and understanding in a nuanced way the political-economy and the shifting power relations. For national law enforcement keen to address organized criminal activity, this kind of framework must underpin the analysis of daily criminal acts in the territories. Assessing individual crimes out of the broader context will prevent the identification of more sophisticated and structured crime network or mafia-like structures. Furthermore, without a basis for analysis and monitoring of trends will result in a consistently reactive, as opposed to proactive, approach to the onset of criminality. The mafia, in Italy or elsewhere, will only be defeated “by an army of teachers” as the great Sicilian writer Gesualdo Bufalino once said. Thus, law enforcement, policy makers and all those with a desire to break mafia influence need to set themselves up as students. A combination of experience, coupled with historical and cultural knowledge of these phenomena can form the basis of a pro-active strategy that remains the most effective tool to combat this form of crime. Secondly, it emphasizes the need to look beyond criminal justice and law enforcement responses to counter mafia style organised crime. Falcone and Borsellino posthumously fulfilled their quest, not through prosecutions and indictments, but as martyrs, mobilizing public opinion and awareness to the scale and destructiveness of mafia influence. Mafia groups leverage on local dependency to gain legitimacy and entrench themselves deeply into the fabric of society. Into that environment, punitive law enforcement action can trigger local resistance and strengthen mafia groups rather than weakening them. Instead, mafia groups need to be attacked through the levers they themselves employ: reducing their profits; reducing their influence on politics, and finally reducing their legitimacy in the eyes of the closest constituents. In conclusion, it is clear that the fight against mafia groups, in Italy or elsewhere, will be neither easy nor swift. It will require the courage and integrity of a great number of anti-mafia crusaders. But it remains unquestionably a fight worth making. And in the case of the Sicilian mafia groups, the current environment might just be right for a hard strike. Nel mondo poliziesco si dice che tre indizi fanno una prova, forse perché il numero è perfetto anche in questo senso, ma una cosa è certa, se non fanno una prova di certo influenzano molto l’analisi critica di un fenomeno. Citando me stesso, in maniera politicamente scorretta, nel mio libro Mafie Potere e Geopolitica, sostengo ed argomento che le mafie non saranno mai sconfitte, come per altro la criminalità in genere ma che esse si generano, arrivano ad un acme, crollano e poi fisiologicamente riemergono in forme esteriori differenti e frutto della contemporaneità. Combattere le mafie è un tema estremamente dibattuto quotidianamente soprattutto nell’epoca in cui l’esercizio del diritto di parola si è svuotato del suo valore assoluto per essersi trasformato in un dovere di parola che genera una grande confusione. Si finisce in questo modo per parlare di fenomeni conosciuti per luoghi comuni e categorie concettuali preconfezionate a beneficio di un pubblico acritico e, per varie motivi, poco incline all’approfondimento. Ed è in virtù di questa superficialità che le mafie proliferano spesso indisturbate. Ma la vera notizia, dal mio punto di vista, è che la mafia siciliana ha superato la fase finale dell’era corleonese, iniziata con le stragi del 1993/1994 ed è tornata alle origini ripartendo da punto zero ovvero dalle estorsioni ai proprietari terrieri, ai commercianti e persino, incredibile ma vero al furto di bestiame e all’assegnazione degli edifici di edilizia popolare. Con la caduta dei corleonesi, l’intera struttura che sosteneva Cosa Nostra siciliana, sotto il profilo strettamente criminale, non ho intenzione di affrontare l’aspetto, pur esistente, di natura economica e politica, ha subito un contraccolpo che ha esaurito i suoi effetti a distanza di vent’anni; questo lungo processo ci consegna, una mafia siciliana (in verità già da tempo) che dopo aver toccato il fondo, ovvero aver perso la maggior parte della rete relazionale economica e politica a livello nazionale ed internazionale è costretta a ripartire da zero, o meglio da 0.0. Attenzione, io parlo della mafia siciliana che nell’epoca della dittatura corleonese raccoglieva quello che dall’alto cadeva, se non proprio le briciole, di certo la parte meno consistente dei grandi interessi criminali che il sistema mafioso corleonese generava. Nel gennaio dello scorso anno, la famiglia mafiosa di Gela (CL) è stata accusata di controllare, mafiosamente la guardiania di alcune ditte edili nonché l’assegnazione delle case di edilizia popolare in favore dei propri affiliati o estorcendo denaro per l’assegnazione a chi non ne aveva diritto. Nell’aprile dello scorso anno i Carabinieri hanno arrestato alcuni appartenenti alle mafiose di Montelepre (PA) che avevano ripreso i contatti con le famiglie di New York al fine di ricostruire un legame evidentemente interrotto. Ma c’è di più: gli stessi personaggi si sono resi responsabili di furto di bestiame in danno di allevatori del circondario. Nei giorni passati i Carabinieri di un paesino della provincia di Catania, Adrano, hanno arrestato due giovanotti perché ritenuti responsabili di una estorsione ai danni di 21 piccoli proprietari terrieri del circondario avvalendosi del metodo mafioso. I giovani picciotti appartengono al clan mafioso egemone nel paese, quello degli Scalisi, storica famiglia che da lungo tempo rappresenta il potere mafioso ad Adrano ed era collegata, ai tempi d’oro, al catanese Benedetto “Nitto” Santapaola e quindi nell’alveo della dittatura corleonese su Cosa Nostra Siciliana. E le famiglie palermitane, la nobiltà mafiosa dell’isola? Sin dalla seconda metà dello scorso anno sono stati accertati tentativi di ricostituzione in forma aggregata di una struttura che fosse portatrice degli interessi delle famiglie delle province di Trapani, Agrigento e Palermo. Dopo anni di sopravvivenza attraverso la commissione di reati di basso profilo e poco remunerativi, sebbene sempre in forza della capacità d’intimidazione solamente indebolitasi nel recente passato, le famiglie mafiose isolane hanno iniziato ad avvertire la necessità di riacquisire profitto e potere. Il mafioso può aspettare che passi la piena del fiume, ma non in eterno; e poi c’è da far fronte alle migliaia di appartenenti alle cosche arrestati e detenuti ed alle loro famiglie. A provvedere alle necessità di chi è in carcere deve essere, nella logica mafiosa, chi può farlo cioè chi è libero. Ma la situazione oggi, è mutata infatti sempre maggiori sono le denunce di chi subisce richieste estorsive così come scarsi sono gli introiti dovuti al traffico di sostanze stupefacenti dovendosi limitare al controllo dell’ultima parte della filiera di spaccio; per non parlare poi dei soldi pubblici per gli appalti che sono veramente ridotti al lumicino. Ed allora cosa fare? Ripartire da zero appunto, da un lato accumulando capitale primario da reinvestire in attività lucrose come il traffico di sostanze stupefacenti a livello internazionale, ma per rendersi nuovamente credibili come in passato c’è bisogno di relazioni forti e da qui il rientro in Sicilia di molti, soprattutto figli e nipoti, fuoriusciti sotto la dittatura corleonese. Quindi l’importanza delle notizie sopra riportate, dal punto di vista dell’analisi criminologica, attiene alla conferma che i fenomeni criminali mafiosi risentono logicamente delle contingenze storiche e con esse si confrontano sapendone trarre sempre il maggior beneficio. In Sicilia, dopo la stagione delle stragi, 1993-1994, la mafia siciliana, a mio parere già all'epoca non più sotto l’egemone controllo del gruppo di potere che faceva capo ai corleonesi, dovendosi rapportare ad un futuro del tutto imprevedibile ha messo in pratica il detto siciliano “chinati Junco che passa la china”. Le famiglie mafiose, soprattutto quelle con minori legami con i corleonesi di Salvatore Riina sono tornate a fiutare il vento e ripartire dalla considerazione che oramai non ci si potevano aspettare grandi opere, in relazione alle dissestate casse nazionali in cui inserirsi esercitando, come in passato, il potere mafioso, che la Sicilia è al di fuori delle grandi logiche del traffico internazionale degli stupefacenti, e quindi, infine non essendoci all’orizzonte nessun grande business da sfruttare organicamente, hanno deciso di tornare alle origini. Tornare alle origini per la mafia vuol dire tornare alla terra, alla proprietà fondiaria da cui tutto è iniziato. Nell’Ottocento, la destrutturazione del latifondo, formalmente sancita con la Costituzione Siciliana del 1812, ha determinato per cause storiche, che non possiamo delineare in questo scritto per ragioni di spazio, la nascita della mafia siciliana. I proprietari fondiari, nobili e borghesi, affidavano a milizia private il controllo delle proprie terre composte in via esclusiva da criminali quanto mai necessari per fronteggiare le scorribande degli altri fuorilegge. In tal modo, i primi, spesso anche in accordo con i secondi, offrivano i propri servigi ai padroni che in sostanza erano costretti dalle circostanze ad accettare lo stato di cose subendo quindi un ricatto al quale non potevano sottrarsi se non essendo disposti a subire sicure rappresaglie. Ecco perché oggi nell’anno 2014 a distanza di due secoli, in un paesino siciliano la mafia torna alle origini offrendo la propria protezione ai piccoli proprietari terrieri che, poiché lo Stato è, ancora oggi come allora, assente , il più delle volte tacciono. Attenzione, lo stato non è assente solamente fisicamente ma molto più pericolosamente attraverso il comportamento dei suoi rappresentanti di cui la quotidianità racconta le gesta. THE GLOBAL INIATIVE: "Smuggled Futures: The dangerous path of the migrant from Africa to Europe. As a network member I am very proud to host on GEOCRIME site and blog the latest report issued by The Global Initiative about the migration criminal industry from Africa to Europe. Following you can read the executive summary but you allowed to download the entire report just click on the the link on the bottom of this page. In October 2013, Italy captured international headlines when a boat, carrying hundreds of asylum seekers sunk off its coast, killing over 360 people. The incident reflects the tremendous increase in African migration to Europe in recent years, in part due to the Arab Spring. While Africans have been migrating to Europe for decades, the instability across North Africa and the Sahel, coupled with the erosion of Libya’s capacity to control its own borders, has resulted in an unprecedented surge of migrants to Italy in recent years. This surge shows no signs of subsiding. The decision to migrate may be fuelled by a multitude of motivations. Africa has the fastest population growth rate in the world, and although the continent is making momentous economic gains, it has broadly failed to translate these gains into sustainable livelihoods for its youth. Social and economic disparities, conflict, and crime in several countries throughout the continent, many Africans seek out new opportunities across the Mediterranean. It is estimated that in 80 percent of these cases, the journey is “facilitated” by migrant smugglers and criminal groups that who provides a range of services such as transportation, fraudulent identification, corruption of border officials and settlement services. Smugglers in transit countries coordinate with smugglers in source countries to act as guides, escorting individuals across the Sahara Desert, heading towards the coast. Although some smuggling networks are organized criminal structures, many are loosely linked chains of individuals, which make it challenging for authorities to dismantle. Three main smuggling routes characterize the irregular migration to Italy and beyond. The first is the Western route, for which the main source countries are Mali, the Gambia and Senegal. 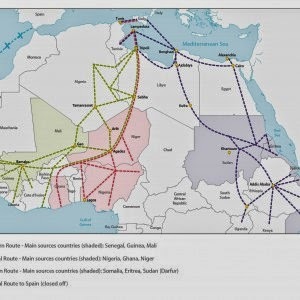 The Western route often connects in the Sahel with the Central Route, for which the source countries are Nigeria, Ghana and Niger. Finally, there is the Eastern route, which sources from Somalia, Eritrea and Darfur in South Sudan, and which tends to cut north through Sudan and Egypt and then along the northern coast of Africa. All of these routes converge in the Maghreb, and in recent years mostly in Libya, for the sea crossing to Italy. The cost of a trip to Italy averages several thousands of dollars, depending on the distance and difficulty of the route, the level of institutional control over the route and on the transit and destination countries’ response to the migrants’ arrival. It may take years to complete, as many remain in transit hubs along their route to work to afford the next leg of their trip. As a result, many migrants are “stuck” in towns along the way to the coast. In addition to exorbitant prices, migrants endure perilous conditions. As they make their way to the Mediterranean coast, migrants are often travel in overcrowded trucks, facing starvation and thirst before even reaching the coast. Once they reach the Mediterranean, people are packed into boats set for Europe, often embarking without enough fuel to make it to Italy. All too often, migrants drown. If migrants do arrive in Italy, their reception is less than favourable. Many are sent back to Africa. Given the exponential rise of irregular migrants and the humanitarian crises that accompany their failed attempts to reach European shores, EU states, including Italy, are under a growing pressure to restructure and align their immigration and asylum policies and practices. Current efforts to limit migration have only succeeded in shifting migration routes, forcing many seeking refuge to take more dangerous, riskier routes to Europe. Finding solutions to the problem of unmanaged migration cannot be limited to Italian border control but require regional cooperation in both Europe and Africa with governments addressing the root causes of mass migration. Dovendo preparare una lezione nell’ambito del master di geopolitica di Oltreillimes, che illustrasse i traffici illeciti nell’area centrale del continente americano mi sono imbattuto nella reale difficoltà di condensare la molteplicità di piani d’analisi che questo tema offre, preferendone alcuni rispetto ad altri nella consapevolezza di mancare di completezza espositiva. Tuttavia, il tempo a disposizione non mi permette altra scelta e quindi, anche in questo scritto, che vuole rispecchiare questo intervento, resterò fedele alle scelte fatte. Premesso ciò, ovviamente, come prediligo sempre fare, partirò dall’analisi geografica dell’area in questione convinto che altro modo non vi sia per porsi nella giusta ottica d’analisi di qualsiasi fenomeno di natura umanistica quand’anche criminale. 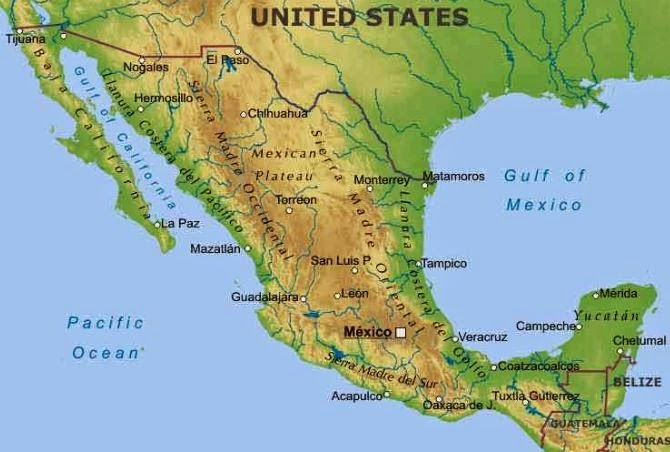 Il Messico pur appartenendo alla porzione australe del continente, per ragioni antropologiche a mio parere, condividendo la definizione dello studioso messicano di origini germaniche, Paul Kirkoff, fa parte di una specifica area culturale quella Mesoamericana che comprende anche il Guatemala, l’Honduras, il Salvador ed il Belize. Questa prima definizione non è solo terminologica avendo avuto una parte decisiva nella formazione delle culture dei popoli di riferimento partendo dalle civiltà Maya ed Atzeche facendo in modo che anche oggi tutte queste realtà nazionali seppur differenti siano unite da un comune strato culturale profondo. L’area mesoamericana oggi è alle prese con grandi sfide che ne determineranno il futuro prossimo e lontano; dopo essere state rinchiuse e confinate ad essere teatro anch’esse della Guerra Fredda tra U.S.A. e U.R.S.S. oggi, sebbene ancora fortemente influenzate dal vicino americano che ha sempre considerato queste terre come il giardino di casa propria, non certo per diletto ovviamente ma in ragione di precise esigenze geopolitiche, oggi dicevo, come mai in precedenza quest’area può approfittare di contingenze internazionali favorevoli per costruire una propria identità sovrana. Queste contingenze sono di natura essenzialmente economica e politica: economica poiché, soprattutto i paesi asiatici, la Cina in primis, si rivolgono a questi territori per ampliare, da un lato lo spazio commerciale e dall’altro l’acquisizione di risorse primarie per il sostegno a lungo termine delle proprie economie e di natura politica poiché oggi gli Stati Uniti sono costretti dal sistema economico globalizzato a scegliere tra potere militare o economico, e tutti sappiamo quale hanno privilegiato, lasciando quindi un certo margine di manovra ai paesi dell’America centrale e latina. Con questi presupposti tuttavia, non sarà facile per i Paesi dell’area ottenere risultati apprezzabili in termini di sviluppo a causa di molteplici problemi strutturali quali, primo fra tutti la presenza di forti strutture di criminalità organizzata locale e a carattere internazionale e transnazionale. L’intero Continente americano è, seppur in forme diverse, afflitto dagli effetti che la produzione, la distribuzione e il consumo delle sostanze stupefacenti genera, effetti che si riverberano quindi ovviamente sui paesi produttori, quelli del Triangolo del Nord, Colombia, Bolivia e Perù, perché ivi operano organizzazioni criminali che sfruttano i contadini che altro non possono fare se non coltivare le piante di coca, sui Paesi centrali, Guatemala, Honduras, El Salvador e Nicaragua, in particolare, a causa del transito dei carichi di coca e su quelli del Nord, America e Canada, come su quelli del sud, Argentina e Brasile, a causa degli effetti che il consumo genera in termini di salute pubblica e quindi costi sanitari e di criminalità diffusa che vive di questi traffici. 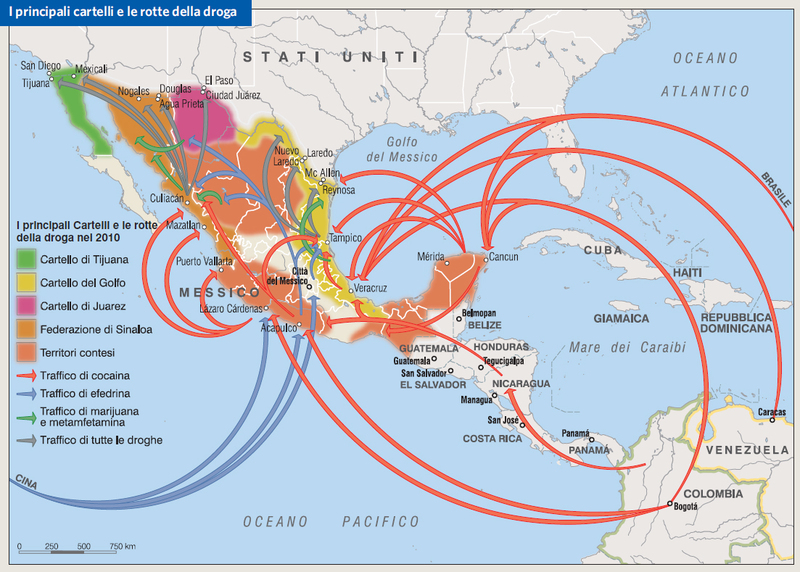 Ed allora come potranno i paesi dell’America centrale, primo fra tutti per importanza il Messico proiettarsi nel futuro sicuri di cogliere le opportunità che oggi la storia offre loro di emancipazione? Tutto dipenderà da quale compromesso sarà raggiunto a livello locale, in ogni Paese con la criminalità organizzata. Sono categorico perché realista e quindi assolutamente convinto che non verrà in alcun modo neanche tentato un contrasto diretto serio e definitivo contro le organizzazioni criminali che operano in quei territori essenzialmente per due motivi: uno economico giacché, soprattutto in tempi di crisi come questi nessuno stato può permettersi di rinunciare alla porzione, per alcuni molto consistente, di p.i.l. ed indotto creato dal narcotraffico e secondo semplicemente perché politicamente non conviene essendo più facile e proficuo trattare con i criminali invece che perdersi dietro politiche sterili e destinate a fallire di contrasto. Ovviamente, dal punto di vista etico non posso certo condividere questo stato di cose essendo anche convinto che ci siano molteplici azioni che si possono intraprendere per risolvere positivamente questo genere di problemi: primo fra tutti l’istruzione. Dal mio punto di vista, tuttavia a parte le speranze, oggettivamente, le amministrazioni coinvolte cercheranno di stabilire accordi con la criminalità organizzata mettendo sul tavolo delle trattive la possibilità di futuri guadagni a patto di ridurre l’effetto della contrapposizione Stato-organizzazioni criminali e quest’ultime tra di esse allo scopo di rendere favorevole, per qualunque investitore spostare capitali nell’area. Si tratta di un compromesso con il diavolo è senz’altro vero ma è quello che accade da sempre come la storia, a volerla approfondire, anche quella scritta dai vinti, ci insegna.